Most who stop by here will recall the initial release of Churchkey beer in 2012. It came in a flat top steel can, not exactly standard packing in the beer industry since the 1960s. You had to pierce the top of the can with an old-fashioned church key opener. Just like yer grandpa did. The steel can novelty didn't garner much traction. There were problems with bulging cans and oxidized beer. Imploding sales forced the company to pull beer from shelves. It really only had a presence in hipster-fueled bars in places like Portland, San Francisco and Seattle. 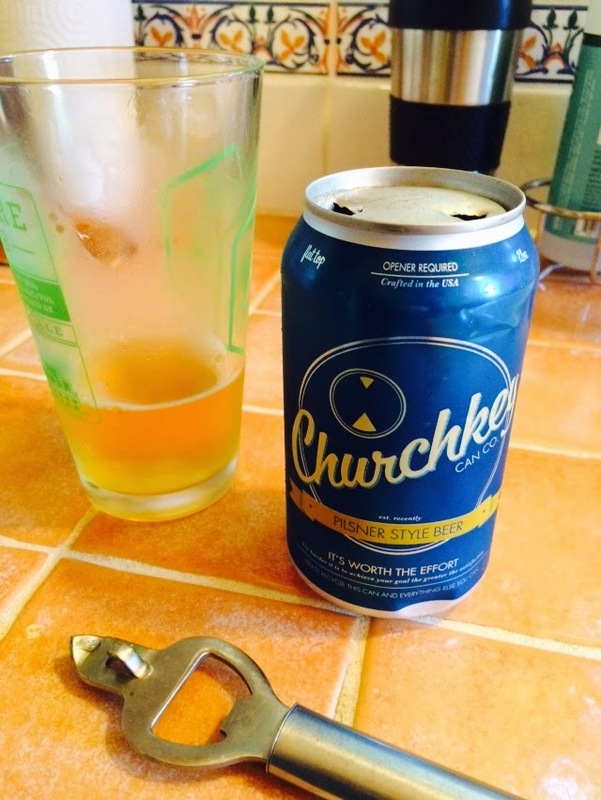 Late last year, Churchkey announced that it would return to the market. They ditched the steel can in favor of an all- aluminum version. The flat top remains, meaning you still need that old fashioned opener. I'll get to why this is a bad idea shortly. Other changes are in play. Adrian Grenier (Vincent Chase on Entourage) assumed control of the venture when he bought out founding partner, Justin Hawkins. The beer, once brewed under contract at Two Beers Brewing in Seattle, is now being produced at Cold Spring Brewing in Minnesota. Make no mistake. The current rendition of the beer, developed by Portland's Lucas Jones and Sean Burke, is plenty good. I didn't think so the first time around. The new Churchkey is a clean, straw-colored pilsner with a bold flavor profile. At least they got that part of the equation right. The can still doesn't make any sense. Going with aluminum instead of decrepit steel was a smart move. So why keep the silly flat top, which requires the old opener? If you don't have the right version of the old opener, you may pierce the sidewall of the can, which is considerably softer than the top. I don't understand. The flat top is a failed novelty. Dump it. Pricing in another concern. Suggested retail will apparently be around $11 a six pack. That makes about as much sense as the flat top. I have no idea what kind of retail reach Churchkey will attain, but I think the price needs to be a couple of dollars lower for it to attract a following. At $11, there are too many great alternatives for less money. The Churchkey folks say they will be launching in a number of states, including Oregon, Washington, California, Idaho, Arizona, Minnesota, Nevada and others. The rollout isn't exactly proceeding at light speed, but they apparently do have a plan. Which suggests they still believe in the marketability of an overpriced beer in a novelty package. At some point you have to wonder if this is some sort of tax shelter.